Be the first to share your favorite memory, photo or story of Elles. This memorial page is dedicated for family, friends and future generations to celebrate the life of their loved one. Cox, Elles "Bud" - Age 83, of Flint, died March 14, 2019. Funeral services will be held 12 PM Sunday March 17 at Sharp Funeral Home & Cremation Center 6063 Fenton Rd. Flint. Pastor Goodman Cox officiating. Interment will be held 9:30 AM Monday at Great Lakes National Cemetery, Holly. Visitation will be held 11 AM - 8 PM Saturday with a American Legion Memorial service at 7 PM Saturday; and 11AM until the time of the service Sunday at the funeral home. Bud was born February 18, 1936 the son of Allen Goodman Cox and Hazel (Monroe) Cox. He was a veteran United States Air Force serving in the Korea War. Bud married Ruth Gearhart on November 3, 1962 in Flint. He was employed with General Motors for 30 years as a fork lift driver before retiring in 1986. Bud was a member of the American Legion Post 294. He enjoyed basketball and football especially University Of Michigan. Bud is survived by his wife of 56 years: Ruth; son: Ed (Donna) Cox of Flushing; daughter: Sue (David) Triplett of Louisville, MS; son-in-law: Brad Morey; grandchildren: Anthony Morey, Amber (Dustin) Weeks, Ashley (Chase) Dove, Jessica Morey, Kaitlyn Cox, Marrisa Cox, Hannah Cox, India Triplett; great-grandchildren: Hayden Weeks, Aubrey Dove, Holden Weeks, Kailani Triplett; brothers and sisters: Liz Thompson, Franklin (Janet) Cox, Louetta Sawyer, Bertie Mae (Ken) Brant, Goodman (Kim) Cox, Donnie (Judy) Cox, Theresa Cox; many nieces and nephews. 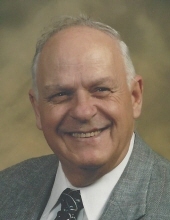 He is preceded in death by his parents; daughter: Janet Morey; brothers and sisters: Allen Cox, Altus Cox, Virginia Lychner, Norma (Bernie) McGaffigan; brother-in-law: Lee Thompson.Tributes may be shared on the obituaries page of www.sharpfuneralhomes.com. To send flowers or a remembrance gift to the family of Elles "Bud" Cox, please visit our Tribute Store. "Email Address" would like to share the life celebration of Elles "Bud" Cox. Click on the "link" to go to share a favorite memory or leave a condolence message for the family.